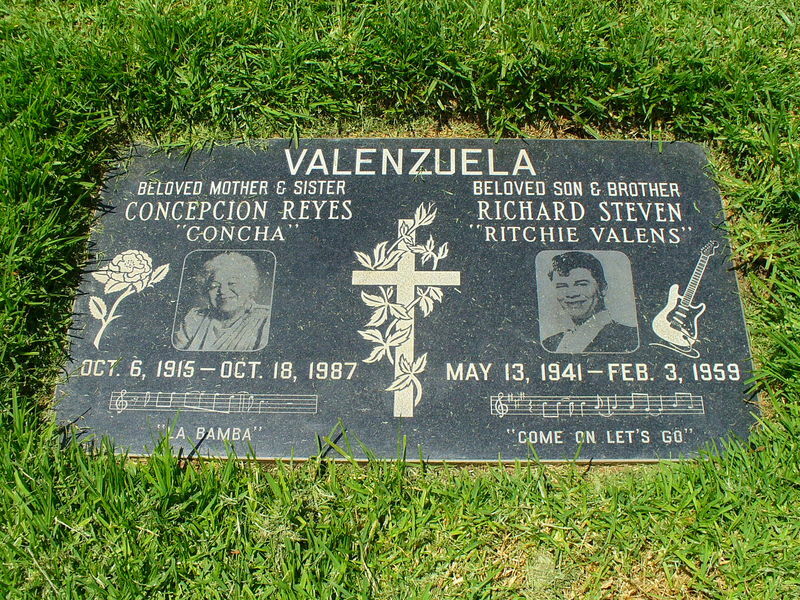 Hands down, my sentimental favorite grave site to visit at San Fernando Mission Cemetery in Mission Hills, Calif. is that of singer Ritchie Valens and his mother, Connie Reyes. UPDATE 6/29/2008 - VERY SPECIAL THANKS to The Godfather of Graving, Roger Sinclair, for supplying this RARE photo of Ritchie's original headstone! Back in 1987, I was living in Detroit and went to a preview screening of the film "La Bamba" because I was told nothing other than it was a musical biography. Sounded great. 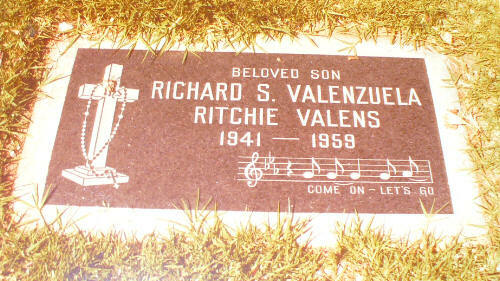 Of course, growing up, I had heard Ritchie Valens' music on the radio but he was totally off my radar as far as his life story went. I would bet the farm that I was the only person in the audience that night who was completely clueless as to the ending. I know, right? Duh. But there you have it. I unabashedly cried my eyes out sitting in the dark theater and long after the lights came up. It is still one of my all-time favorite films, although I wish there was never a reason for it to have been made. At 17, Ritchie was far too young and talented to have left this world. Thankfully his legacy lives on, thanks to his family and fans. 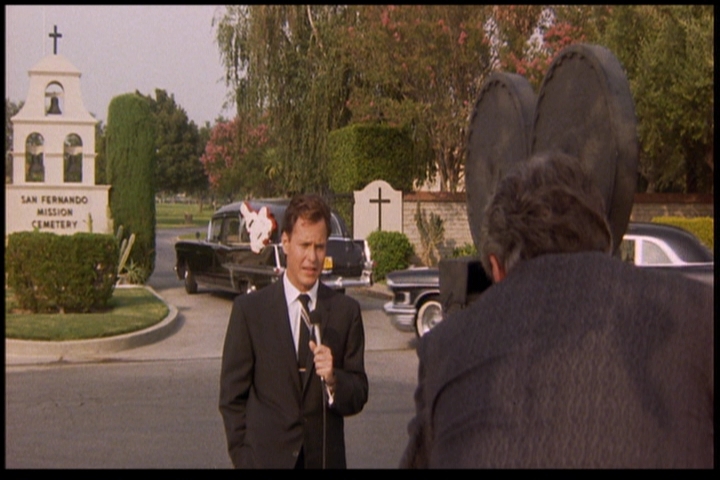 Upon a recent grave hunt to San Fernando Mission, my friend Luis reminded me that the funeral procession scene in "La Bamba" was filmed on location at the cemetery, so I decided to get some screen grabs off the DVD and compare them to what the area looks like now. Easily the most recognizable location is the entrance off Stranwood Ave., where Rick Dees, as deejay Ted Quillen, reports the somber events to a news film camera. It still looks the same, and as you can see by the photo below, a hearse just happened to be driving in when I took the "now" photo, which adds to the eerily similar feel. The scene prior was a bit trickier to track down, as it was not filmed on Stranwood Ave. 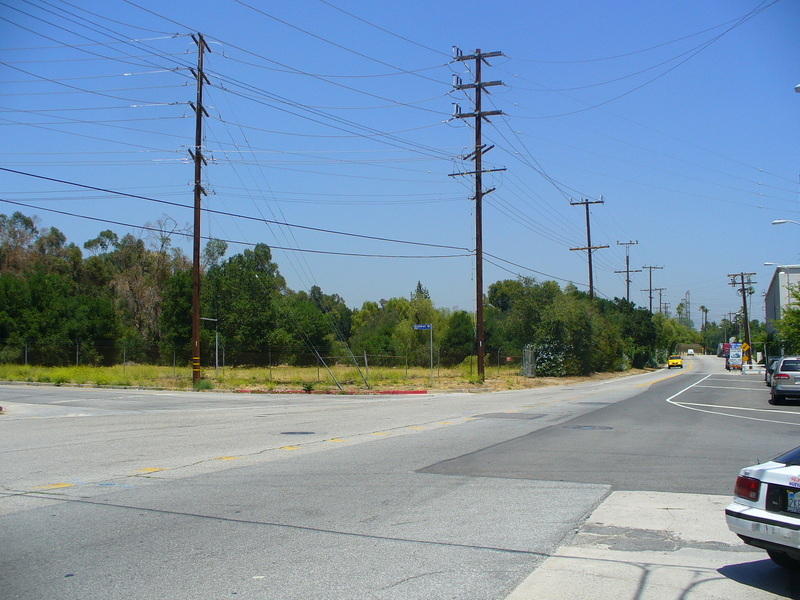 The actual intersection of Stranwood Ave. and San Fernando Mission Blvd. is extremely less scenic than portrayed in the film. 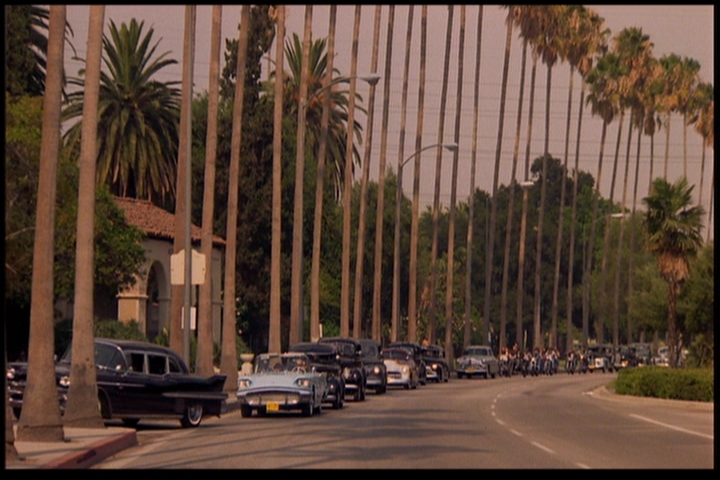 The procession was actually filmed less than a mile away, and to find that location all I had to do was drive around a bit and follow the palm trees. 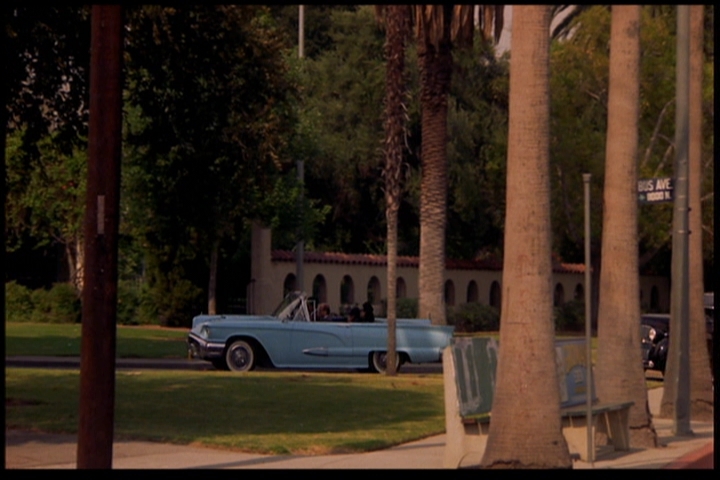 Also, from the screen grab I could see that the street they turn on to is something-bus Ave. 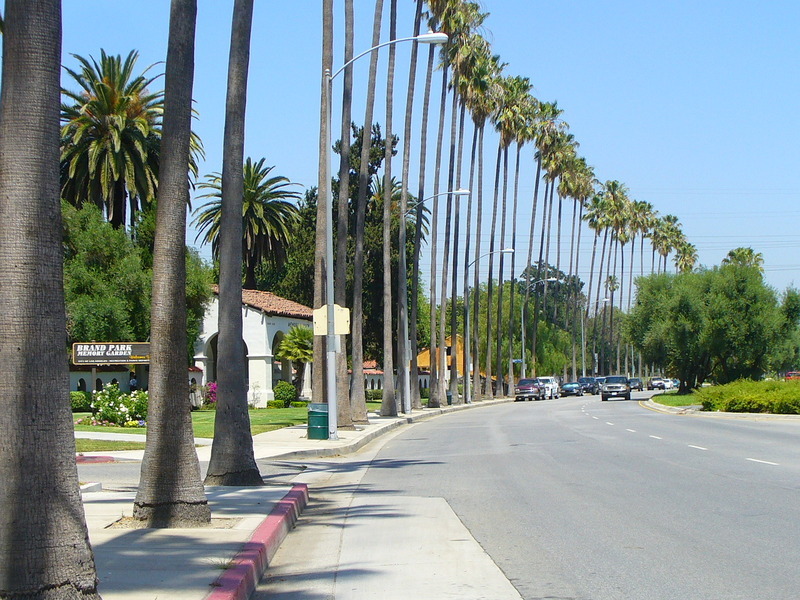 Taking a left off Stranwood on to San Fernando Mission, drive a few blocks down and before you get to the actual Mission San Fernando Rey de España, is Columbus Ave. on your right. 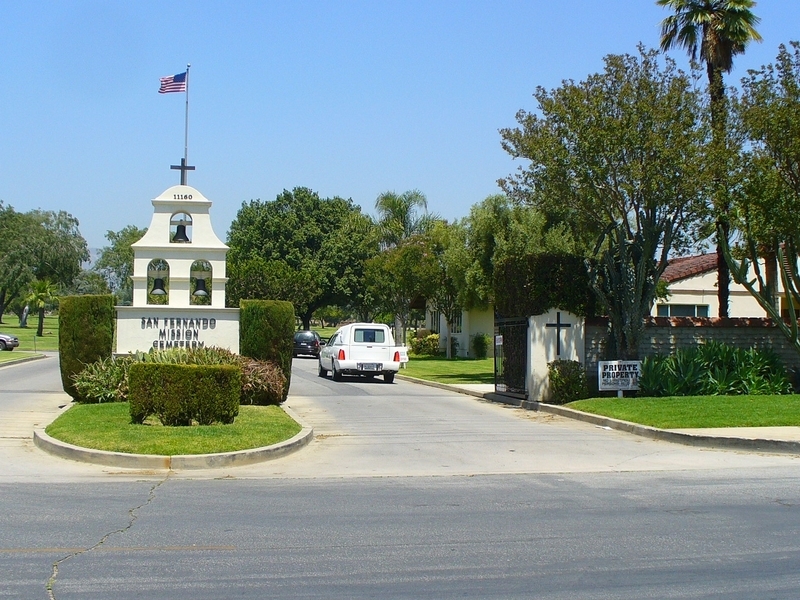 Can't miss it if you look for the Utter-McKinley San Fernando Mission Mortuary sign. 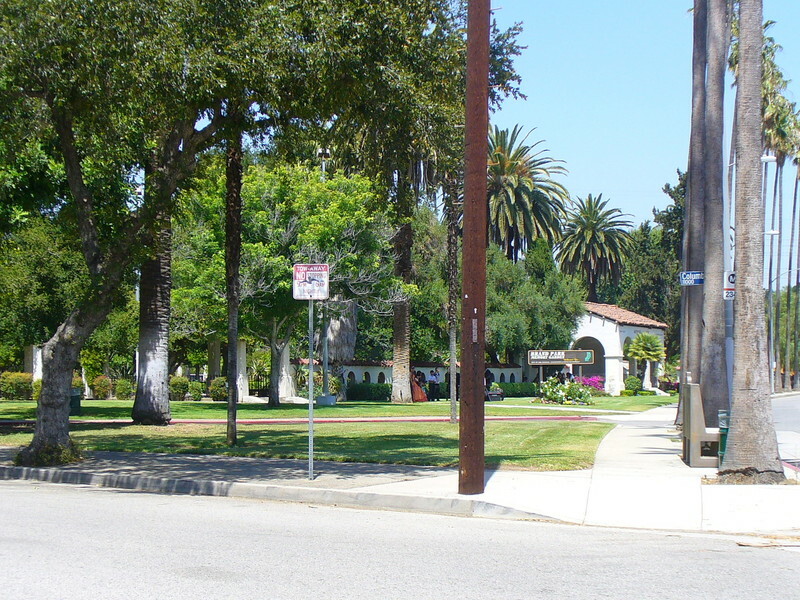 Note: Ritchie's funeral did not take place at Utter-McKinley, but rather Nobel Funeral Chapel, about three miles away, in San Fernando, Calif.
Park at the mortuary or on the street at Columbus and Brand, and you've got the same vantage point as the film cameras that captured the procession rounding the corner off Brand on to Columbus in front of Brand Park Memory Garden. 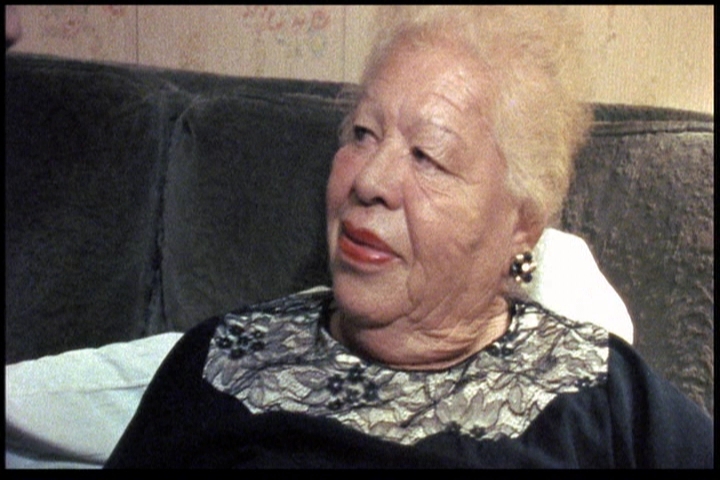 There are two other interesting connections to Ritchie's life and the film, and the cemetery - thanks again to Luis for brainstorming with me on this. 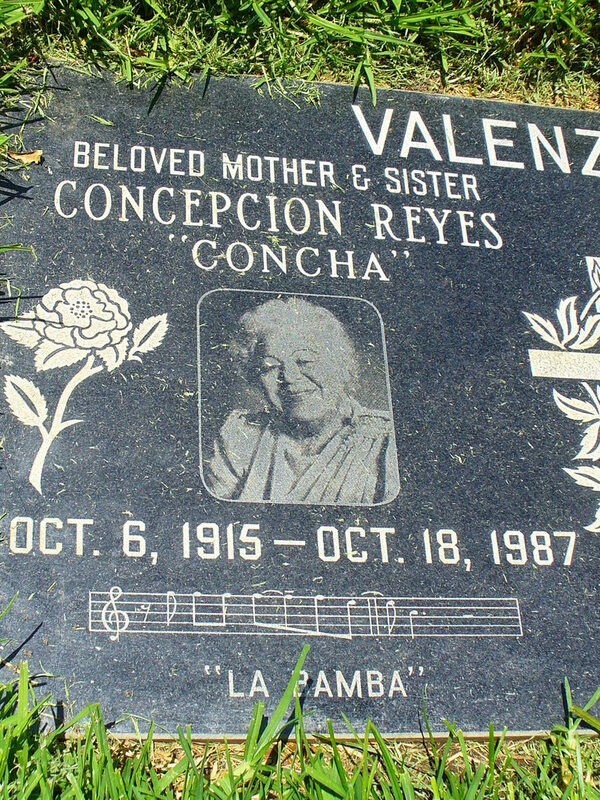 First, his devoted mother, Connie "Concha", passed away three months after the release of "La Bamba" and she is interred in the same grave as her famous and beloved son. You can see Connie in the film, during the first family party scene. She is sitting next to Ritchie (portrayed to perfection by Lou Diamond Phillips, vocals by Los Lobos) as he plays guitar and sings, and the director gave her a beautiful close-up. 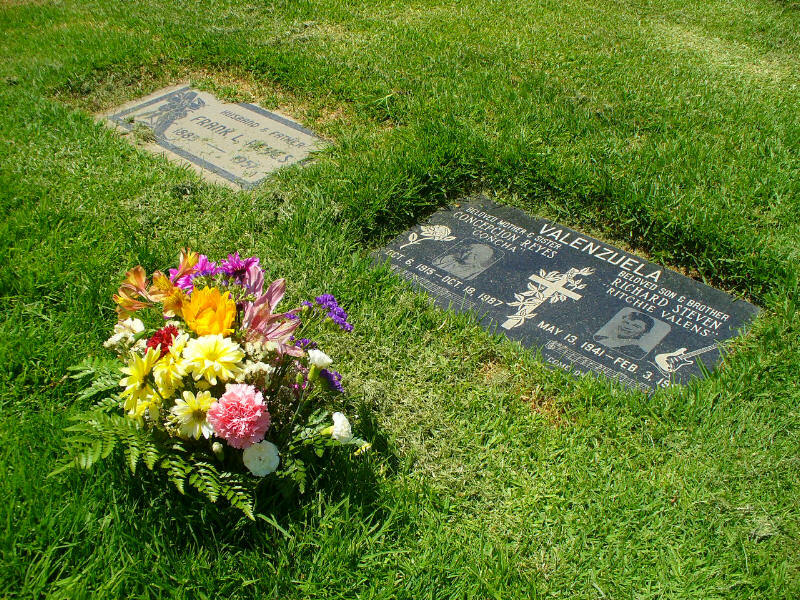 The grave next to Connie and Ritchie is that of Frank Reyes, Connie's father. In the film, Ritchie tells his girlfriend Donna (for whom he wrote the hit song "Donna") about his fear of flying which he developed after the infamous mid-air plane collision over Pacoima Jr. High School. He states that the falling debris killed one of his best friends and although he wasn't at school that day, he is there on the playground in his recurring nightmares about the tragedy. Donna asks why he wasn't at school. "I was at my grandfather's funeral. I guess his death saved my life." 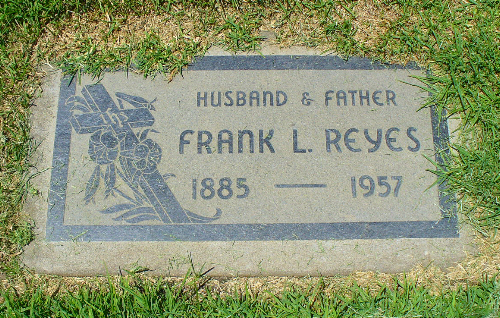 Frank Reyes was that grandfather. Two years later, Ritchie would die in a plane crash and be buried next to Frank. A very good movie about a very special young man. Great website...I live in Australia and saw the movie La Bamba when I was all of 14 years old - I am now 36 and still love the movie and was, and still am, so moved when I think about Ritchie's story. You rock Ritchie! Great set of photos with the story to go with them. I AM 21 AND I LOVE RITCHIE AND BUDDY! The BIG BOPPER was great to but I don't really know much about him. Even in my generation they all are still loved and appreciated. I will teach my kids all about them.They set the foundation for todays so-called music. I wish I was born back then just to see them in concert.It just isn't the same without them. I think it great that you do this. It's sad that so many people are so quickly forgot after there death. Every life is important. the Bible state " Not even a bird falls that GOD does not know" I hope we. People in the USA would go back to the way thing use to be to remember those who have gone before us. And honor there life's and time on this earth. So sad to lose a great singer at a very young age. I really feel so bad for the pain his family had to go through. He will always me remembered through his music and he will live on through his music. God Bless his family.